The Packard Campus of the National Audio-Visual Conservation Center (Packard Campus) is located on 45-acres near Culpeper, Virginia, 75 miles southwest of Washington, DC near the foothills of the Blue Ridge Mountains. 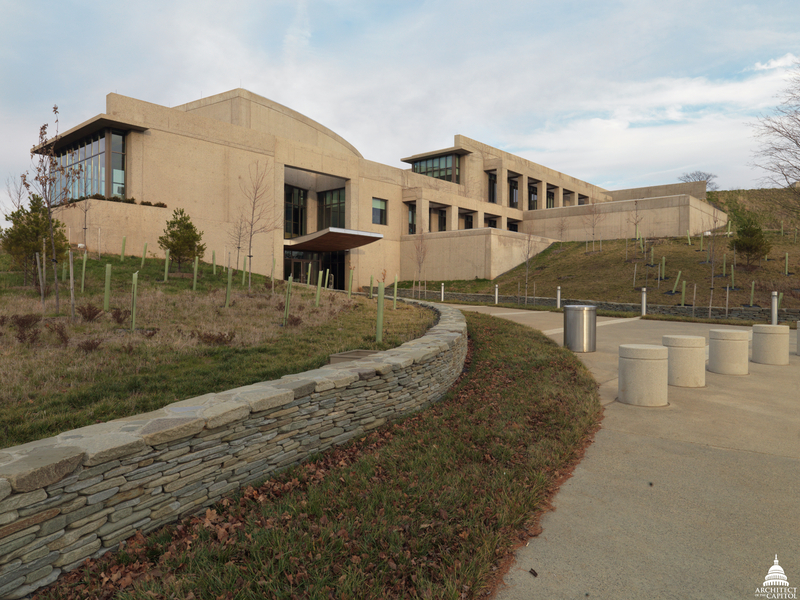 The campus is built into the side of Mount Pony, the highest slope in Culpeper County, and features an adaptive reuse and expansion of a previously existing underground Federal Reserve Bank facility. It was created through a unique partnership between the Packard Humanities Institute, the United States Congress, the Library of Congress and the Architect of the Capitol. 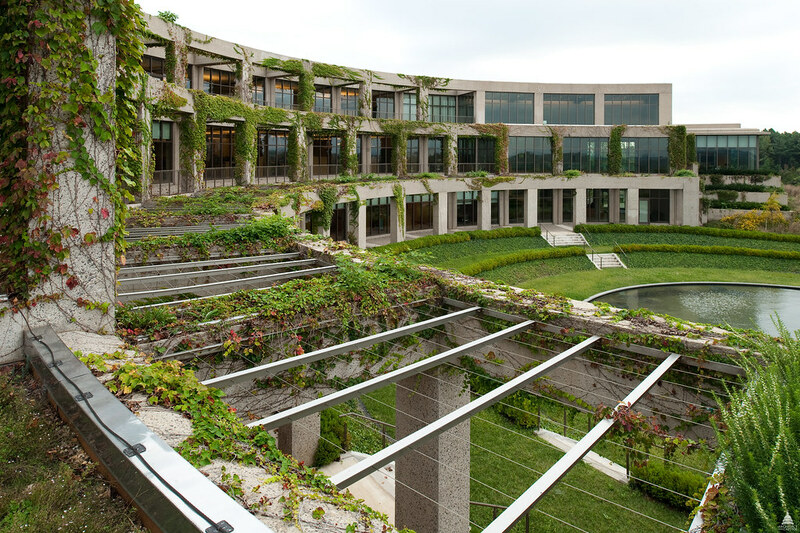 The design of the Packard Campus resulted in a facility that is primarily underground with sod roofs to blend into the existing landscape; great care was taken to minimize its visual impact. 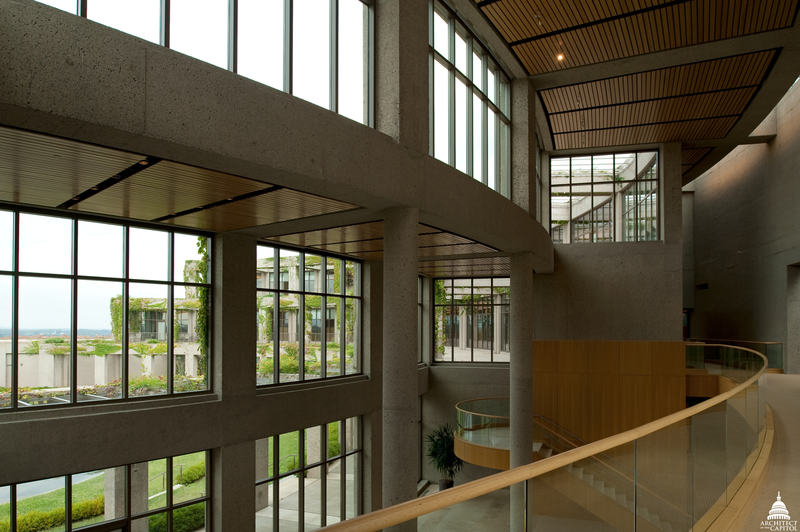 Only the Conservation Laboratory building appears from the hill in a semi-circular terraced arcade to allow natural light into the administrative and work areas. The construction project also included the largest private sector re-forestation effort on the eastern seaboard (over 9,000 trees were planted as well as nearly 200,000 individual plantings). 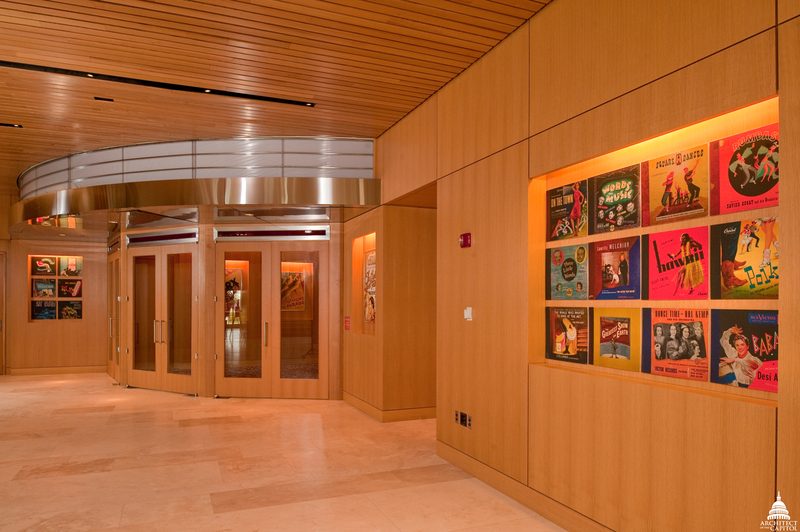 The facility houses 6.3 million collection items (1.2 million moving image, 3 million recorded sound, 2.1 million supporting scripts, posters, photos, etc.) in a state-of-the-art storage environment, including below-freezing for film masters. There are nearly 90 miles of shelving for sound and moving image collections and 124 nitrate film vaults, the largest in the western hemisphere. It is fully equipped to play back and preserve all antique film, video and sound formats. It is the first archive to preserve digital content at the petabyte (1 million gigabyte) level. 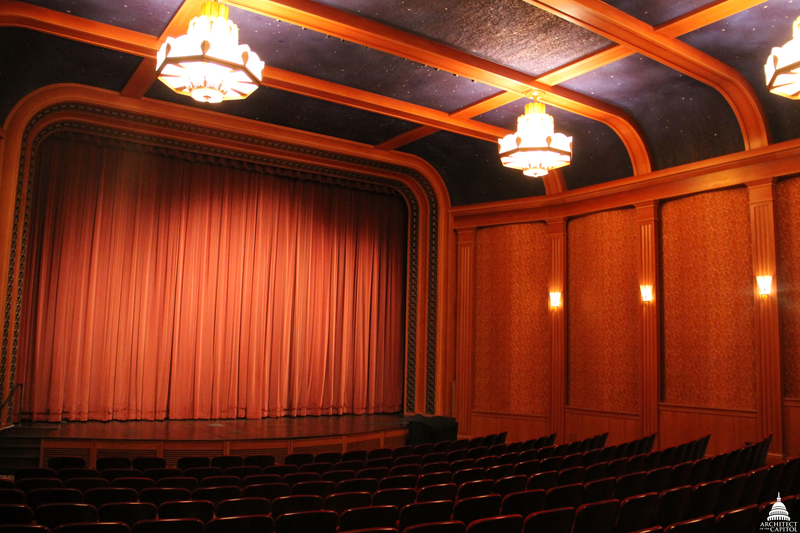 Of special interest is the 200-seat theater capable of projecting both nitrate film and modern digital cinema, which features an organ rising from under the stage to accompany silent film screenings. There is a public listening auditorium for playback of all sound formats. High-speed fiber-optics connect the Packard Campus with the Moving Image and Recorded Sound reading rooms on Capitol Hill. Digital access copies made during the preservation process provide researchers with playback on demand in the reading rooms. The Packard Campus' green roof in bloom. Above the National Audio-Visual Conservation Center at the Packard Campus is a 173,000 square feet green roof. It is one of the largest of its kind on the East Coast spanning an area equal to three football fields. 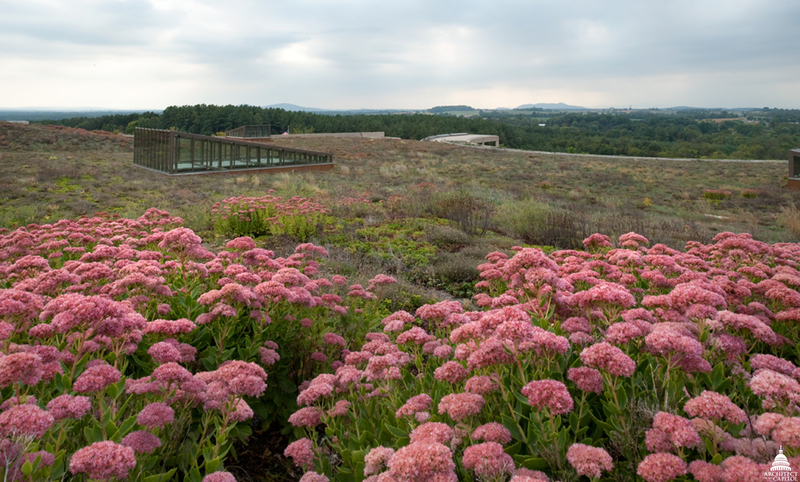 In addition to its aesthetic benefits, the green roof serves several purposes including absorbing rainwater, providing insulation and filtering pollutants. Native grasses and perennials that are tolerant to the local climate, soil and water conditions have been planted on the roof. Great care was taken to minimize the visual impact on the landscape. Two jurisdictions of the Architect of the Capitol – the Library Buildings and Grounds jurisdiction and the Capitol Grounds jurisdiction – worked together to construct the green roof that filters runoff pollution and conserves water. They also maintain the green roof by weeding, replenishing mulch and cleaning-up the roof. The building originally opened on December 10, 1969. It came about as a result of fear during the cold war that a nuclear war would destroy the economy of the United States. The facility was constructed as a bunker to house enough U.S. currency to replenish the cash supply east of the Mississippi River following a catastrophic event. Read more about the Packard Campus on our blog.